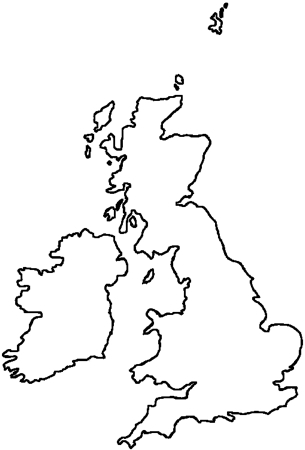 The British Isles are an archipelago in the North Atlantic Ocean off the north-western coast of continental Europe that consist of England, Scotland, and Wales (commonly called Great Britian), as well as Ireland, the Isle of Man, and the Channel Islands. The earliest known use of the phrase Brytish Iles in the English language is dated 1577 in a work by John Dee. Today, this name is seen by some as carrying imperialist overtones although it is still commonly used. Languages: English is the main language, but Welsh is widely spoken in Wales, and Gaelic is spoken by some people in Scotland. Note: The term "British Isles" is controversial in Ireland, where there are nationalist objections to its usage. The Government of Ireland does not officially recognize the term, and its embassy in London discourages its use. Britain and Ireland is used as an alternative description, and Atlantic Archipelago has also seen limited use in academia.